Military Campsite presumably on Salisbury Plains, Dorset. 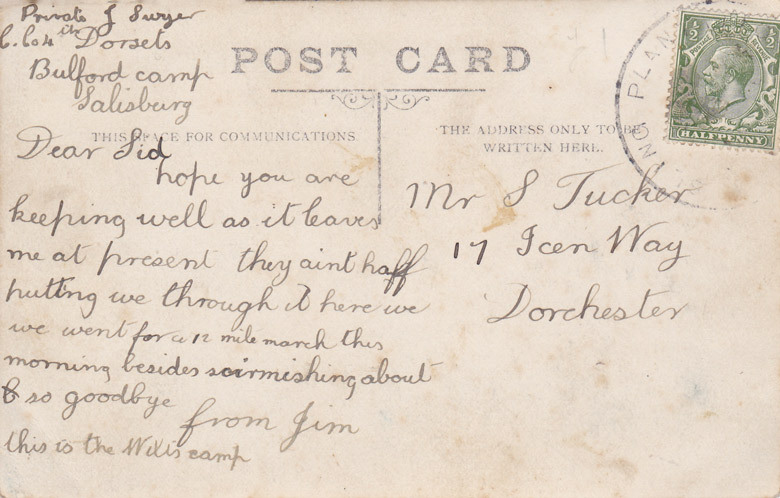 Back of post card with Jim Swyer's note to Sid Tucker. Post marked Sling Plantation. This post card was sent by Private Jim (? James) Swyer of the 4th Dorsets to Sid (?Sidney or perhaps Sydney) Tucker of 17 Icen Way in Dorchester. Jim gives his address as 4th Dorsets, Bulford Camp, Salisbury. 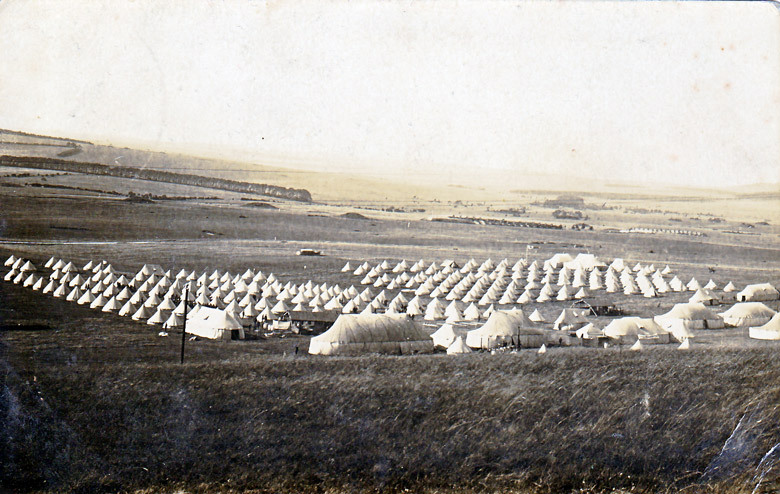 The Sling Plantation campsite was occupied by New Zealanders during World War I. Jim's comment that this is the Wilis camp presumably refers to the camp in the picture. There was a Private James Swyer who was a member of the Dorsetshire Regiment during World War I (the Great War). Initially he was a member of the Territorial Force (4th Regiment, regimental number 1776) and perhaps later became a member of the regular forces (regimental number 200202). He was awarded the Victory Medal, the British Medal and the Territorial Force War Medal. A James Swyer was baptised on the 9th July 1893 in the Parish of Fordington St George in Dorset. His parents were shown as Charles James and Eliza (nee Brownsea?) who were living in Mill Street, Fordingham. Later the family moved to Vicarage Lane in Dorchester. My great grandfather Septimus Swyer was born in Dorset in about 1835. Was James a relative?